Irish UFC lightweight Joseph Duffy. 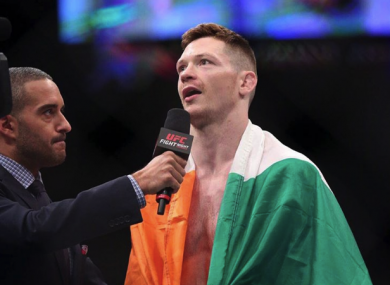 THERE’S UNCERTAINTY OVER Joseph Duffy’s future on the UFC roster after the Irish lightweight revealed that negotiations regarding a new contract haven’t gone according to plan. Duffy, who moved to the UFC from Cage Warriors in January 2015, has one fight remaining on a five-fight deal. The 28-year-old has been offered a new contract to extend his stay with the organisation, but the terms aren’t what he was hoping for. Duffy also told The42 that he has been offered a bout on UFC Fight Night 99, which takes place in Belfast on 19 November. However, that has so far been rejected as Duffy believes a win over the proposed opponent — whose name he didn’t reveal — will do little to advance his career. “Of course I’d be very disappointed to miss the Belfast card but I just feel that the fight I was offered didn’t make sense,” said Duffy, who was born in Donegal and is currently based at the Tristar camp in Montreal. “There was no real upside to the fight for me. With it being the last fight on my contract, I feel there’s no benefit for me in taking it. “This is the fight game and at this level every fight I take has to mean something to me in more ways than one. I’m training hard and I feel great. I’ve never been more focused than I am right now so I guess it’s just a matter of waiting for the right fight for me. Duffy’s professional record reads 16-2, with his four fights in the UFC to date yielding three first-round victories. The only setback was a decision loss at UFC 195 back in January when he faced Dustin Poirier, who’s now ranked seventh in the lightweight division and headlines this weekend’s UFC Fight Night 94 card against Michael Johnson. The Burtonport native bounced back in emphatic fashion in July, when he needed just 25 seconds to dispose of Mitch Clarke. Duffy is adamant that he’s ready for another tilt at a ranked opponent, having learned a great deal from his defeat to Poirier — a bout which was originally due to headline UFC Fight Night 76 in Dublin last October, until Duffy was removed from the card after sustaining a concussion in training. “In this game it’s all about the right fights at the right time. I’m still on my first contract so we’re not exactly making enough money to set ourselves up for life, and in this game one injury could end your career in an instant,” explained Duffy, who earned a disclosed $20,000 for his clash with Poirier, while his opponent picked up $84,000. Talks between the UFC and Duffy over a new contract have reached an impasse for now, and he admits there’s a strong chance that he’ll add to the growing trend of UFC athletes testing free agency after he fights out the last bout on his current contract. Duffy’s team-mate, former UFC welterweight title challenger Rory MacDonald, recently became the latest high-profile departure when he took up a contract offer from rival promotion Bellator instead of accepting what was on the table from the UFC. With Cathal Pendred and Paddy Holohan retiring in 2015, and Paul Redmond and Norman Parke both being released by the UFC, losing a fighter of Duffy’s calibre and popularity would be a significant blow to the UFC in Ireland. “No, I’m not close at all [to signing a new deal]. I have been offered a new contract to sign but I don’t feel like I’m valued. The negotiation seems to be a case of take it or leave it,” Duffy explained. Duffy added: “I feel that I’ve done what’s been asked of me from the UFC by putting on exciting fights and always going for the finish. I feel the fans appreciate that also. Email “Contract impasse leaves Duffy on course to miss UFC Belfast and test free agency”. Feedback on “Contract impasse leaves Duffy on course to miss UFC Belfast and test free agency”.